Flick escaped to London, not just for the bright lights but because she felt it was the best thing to do, escape from the little village of Heartcross in the highlands of Scotland. Now London has lost its magic and Flick has lost her grandmother it is time to return to Heartcross, initially only for a few days. She finds a place changed, the tea rooms her grandmother used to run closed. Her friends she left behind have moved on and perhaps not quite forgiven Flick for her sudden departure and Fergus Campbell seems to be everywhere Flick turns. Flick plans to return to London but when the weather transpired against her with first snow and a powerful storm, Flick cannot go anywhere but then neither can anyone else as the only bridge into the village is swept away. Flick is stranded and feels that perhaps Heartcross is where she always should be as she pulls together the community to help each other and survive whilst someone decides how important it is to get the bridge back up. Reopening the tea room gives a place for the villagers to gather, hear news and most of all be fed as food is pooled and rationed to maintain supplies at least in the interim. It also gives Flick peace and a sense of purpose and wellbeing that she has not felt before in the village. As Flick becomes the spokesperson for the village and deals with the bureaucracy she uses some ideas to get the community to come together and solve their own problem of being stranded. But whilst they are cut off, it gives others a chance to be able to heal former rifts and friendships are reborn, relationships revisited. Will it be happily ever after for Flick and will they ever be able to cross the bridge again? This is a wonderful heartwarming novel, which deals with many issues across a spectrum – from “cradle to grave” and all of the characters in the book are wonderful. Add to that the setting of Scotland and the power of the weather and it felt I was transported right up there and was sharing the community spirit which simply floated off the pages. This book is perfect for fans of Katie Fforde, Trisha Ashley and Carole Matthews. I am really looking forward to going back to Heartcross and catching up with everyone in the next book. 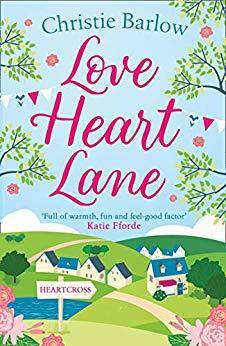 Love Heart Lane is out now and the next book Foxglove Farm will be published in June 2019.